Chloride channels are a diverse group of proteins that regulate fundamental cellular processes including stabilization of cell membrane potential, transepithelial transport, maintenance of intracellular pH, and regulation of cell volume. 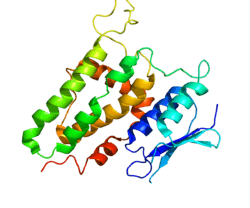 Chloride intracellular channel 2 is a member of the p64 family; the protein is detected in fetal liver and adult skeletal muscle tissue. This gene maps to the candidate region on chromosome X for incontinentia pigmenti. ↑ Heiss NS, Poustka A (Nov 1997). "Genomic structure of a novel chloride channel gene, CLIC2, in Xq28". Genomics. 45 (1): 224–8. doi:10.1006/geno.1997.4922. PMID 9339381. 1 2 "Entrez Gene: CLIC2 chloride intracellular channel 2". Thiemann A, Gründer S, Pusch M, Jentsch TJ (1992). "A chloride channel widely expressed in epithelial and non-epithelial cells". Nature. 356 (6364): 57–60. doi:10.1038/356057a0. PMID 1311421. Rogner UC, Heiss NS, Kioschis P, et al. (1997). "Transcriptional analysis of the candidate region for incontinentia pigmenti (IP2) in Xq28". Genome Res. 6 (10): 922–34. doi:10.1101/gr.6.10.922. PMID 8908511. Dhani SU, Mohammad-Panah R, Ahmed N, et al. (2003). "Evidence for a functional interaction between the ClC-2 chloride channel and the retrograde motor dynein complex". J. Biol. Chem. 278 (18): 16262–70. doi:10.1074/jbc.M209828200. PMID 12601004. Fan L, Yu W, Zhu X (2003). "Interaction of Sedlin with chloride intracellular channel proteins". FEBS Lett. 540 (1–3): 77–80. doi:10.1016/S0014-5793(03)00228-X. PMID 12681486. Board PG, Coggan M, Watson S, et al. (2005). "CLIC-2 modulates cardiac ryanodine receptor Ca2+ release channels". Int. J. Biochem. Cell Biol. 36 (8): 1599–612. doi:10.1016/j.biocel.2004.01.026. PMID 15147738. Bruneel A, Labas V, Mailloux A, et al. (2006). "Proteomics of human umbilical vein endothelial cells applied to etoposide-induced apoptosis". Proteomics. 5 (15): 3876–84. doi:10.1002/pmic.200401239. PMID 16130169.